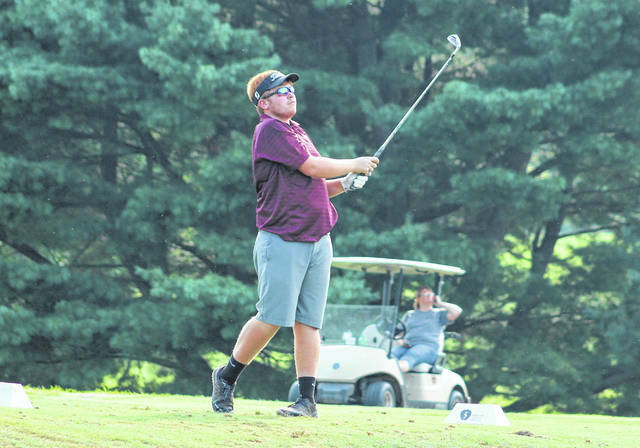 Meigs senior Wyatt Nicholson watches a tee shot on the 12th hole during an Aug. 20 TVC Ohio golf match at Franklin Valley Golf Course in Jackson, Ohio. GAHS senior Hunter Copley tees off on the 15th hole at OSU Golf Club’s Gray Course during the first round of the OHSAA Girls Division II State Championships on Oct. 12 in Columbus, Ohio. 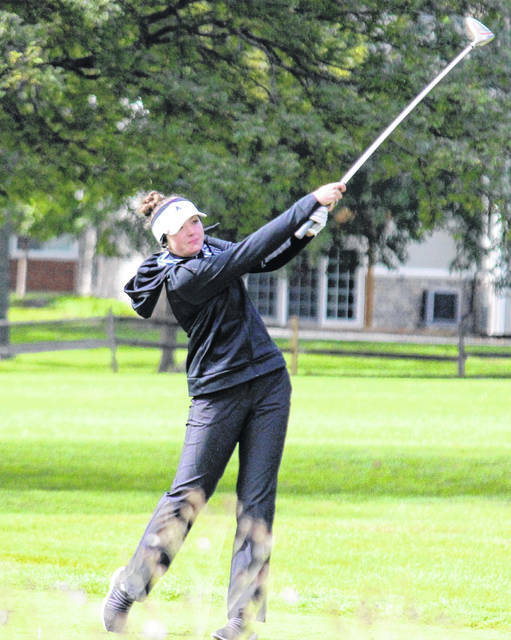 The Ohio Valley Publishing area had a dozen people chosen to the Southeast Ohio District Golf Coaches Association teams, as voted on by the coaches within the district. Gallia Academy and Meigs each produced outright girls championships in their respective leagues, which ultimately led to those two schools leading the way with six and three selections, respectively. Eastern and Southern shared the TVC Hocking boys crown and landed a single pick apiece, as did the River Valley girls squad. The Blue Angels had the most representation after landing five people on the Division II girls all-district list, which included Mark Allen as the coach of the year. Senior Hunter Copley was a first team choice, while senior Molly Fitzwater and junior Bailey Meadows were second team selections. Sophomore Lilly Rees was also named honorable mention for the OVC and district champions. Meigs sophomore Caitlin Cotterill and River Valley senior Chloe Gee were honorable mention selections in Division II as well. Hannah Shrout of Fairland was the D-2 district player of the year. The Blue Devils were represented by sophomore Cooper Davis as a honorable mention choice in Division II boys. Senior Wyatt Nicholson of Meigs was a second team selection, while junior teammate Bobby Musser was named honorable mention in D-2. Dan Drummond and Ty Schobelock, both of Unioto, were respectively chosen as the coach and player of the year in Division II. Eastern senior Ryan Harbour was a second team selection in Division III, while Southern senior Jarrett Hupp was chosen as honorable mention in D-3. Brian Carney of Crooksville was the coach of the year in the district, while Eli Montgomery of Western was the D-3 player of the year. Nicholson, Harbour, Fitzwater and Gee were repeat selections to the all-district squads from a year ago. Ty Schobelock, Unioto; Jacob Calvin, Unioto; Shayne DeWitt, Fairfield Union; Clayton Thomas, Fairland; Conner Heffner, Waverly; William Sturgill, Portsmouth. Coach of the Year: Dan Drummond, Unioto. Cord Ebert, Logan Elm; Wyatt Nicholson, Meigs; Reece Bellville, Fairland; Trevor Newkirk, McClain; Whit Byrd, Alexander; Brayton Felger, Westfall. Braydon Easterling, Ironton; Matthew Walker, Westfall; Cooper Davis, Gallia Academy; Blake Rangegar, Fairfield Union; Evan Huffman, Logan Elm; Trey Gweng, New Lexington; Levi Gerber, Unioto; Bobby Musser, Meigs; Noah Nobles, Vinton County; Andrew Vogt, Alexander; Cole Robertson, Waverly; Brady Woodbridge, Zane Trace; Trenton Newkirk, McClain; Jay Styers, Circleville. Eli Montgomery, Western; Hunter Dutiel, Miller; Brock Jordan, Western; Brock White, Crooksville; Logan Hayslip, Manchester; Wesley Jenkins, Waterford. Coach of the Year: Brian Carney, Crooksville. Owen Carney, Crooksville; Carson Hall, North Adams; Ryan Harbour, Eastern; Jacob Hoover, Pike Eastern; Dalton McDonald, Manchester; Dakota Pell, West Union. Blake White, Crooksville; Ryland Donley, Fairfield; Jarrett Hupp, Southern; Eric Dotson, Belpre; Zach Harless, Whiteoak; Andrew Cochenour, Pike Eastern; Luke Hayslip, Manchester; Brooks Soprano, Waterford; Jacob Pell, West Union. Hannah Shrout, Fairland; Ashley Offenberger, Waterford; Maddi Shoults, Westfall; Hunter Copley, Gallia Academy; Lindsey Daniel, West Union; Katy Pertuset, Portsmouth. Coach of the Year: Mark Allen, Gallia Academy. Molly Fitzwater, Gallia Academy; Hannah Jankauskas, Warren; Rachel Shuler, Fairfield; Bailey Meadows, Gallia Academy; Brooklyn Tolle, North Adams; Erika Matain, McClain. Natalie Shope, Zane Trace; Allison Baughman, Crooksville; Peyton Scott, Lynchburg-Clay; Madalynn Roby, Belpre; Alexis Tompkins, Fairfield; Bryn Karnes, McClain; Emily Lott, Unioto; Lynne Dale, Logan Elm; Lauren Bevins, Pike Eastern; Caitlin Cotterill, Meigs; Chloe Gee, River Valley; Addi Spped, Fairland; Zoe Miller, Warren; Lilly Rees, Gallia Academy; Madison Fulton, West Union; Alicia Dickinson, Waterford; Isabella Lambert, Vinton County. Editor’s Note: This story will appear in the Thursday sports editions of the Gallipolis Daily Tribune and The Daily Sentinel.